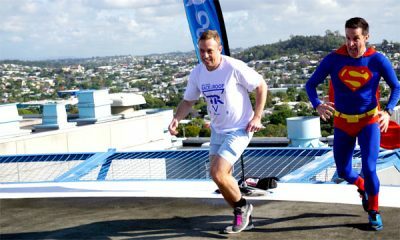 Health Minister Steven Miles and Team Royal Captain Adam Scott reach the RBWH helipad after a gruelling 288 steps. Almost 250 runners and walkers from Royal Brisbane and Women’s Hospital are feeling the burn after participating in the 15th annual QSuper and RBWH Race to the Roof. The event was supported by Minister for Health and Minister for Ambulance Services Steven Miles who joined participants to conquer the 288 steps. The theme this year was ‘Bring out your superhero”. Director of Cardiac Sciences and Team Royal Captain Professor Adam Scott said the superhero theme was chosen to be so much more than an opportunity to dress up. “The theme this year was chosen to serve as a reminder that everyone who works in the hospital is a superhero,” Adam said. Funds raised this year will benefit Team Royal, with $1000 going to A Million Metres for Melanoma.